Land of the Sky Wilderness School: Free Snowboard? What?!?! 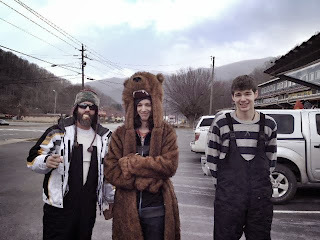 We endured a brutal -30 degree and worse wind chill under snow machines yesterday to shred Cataloochee Ski Area! It was great - when you could see and feel things. LOTSWild now offers FREE SNOWBOARD rentals to any and all students (camp, martial arts, clinics). We stock a variety of sizes, bindings and boards for you to use. We're trying to make the sport and incredible training experience that is snowboarding accessible to more kids, teens, and adults, by making it cheaper. Join Us!